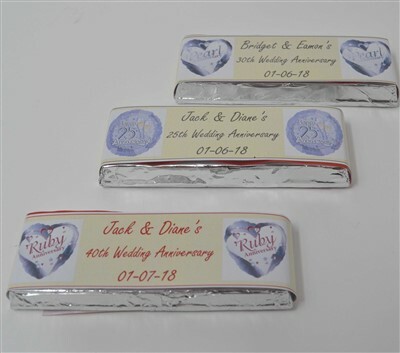 Personalised KitKat wrappers (suitable for 2 finger bars) personalised to your requirements make a wonderful souvenir of your special occasion. You can choose to do the wrapping yourself or we can do it for you and supply the KitKat fingers for a little extra. Each sheet is printed with 10 wrappers ready for you to cut out and apply. Alternatively we can do it for you supplying a quantity of 10 complete 2 finger bars with personalised wrappers. If you choose the wrapped bars option you will be purchasing in increments of 10. **please click the box above your chosen design. Enter the text you would like on the front to a max of 8 words. You can also add a special message on the back.